Wole Soyinka Prize for Literature 2018 shortlist announced. 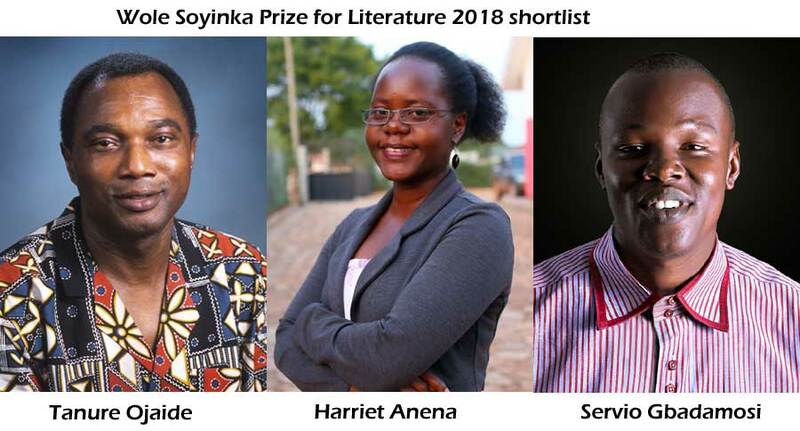 The Wole Soyinka Prize for Literature 2018 shortlist has been announced with Harriet Anena, Tanure Ojaide, and Servio Gbadamosi in the running. The Wole Soyinka Prize for Literature, worth US$10,000, is awarded every two years to the best book written by an African in any of the literary genres. Previous winners of the prize include Sefi Atta for Everything Good Will Come in 2006 and Nnedi Okorafor, Zahrah the Windseeker in 2008. In 2010, Kopano Matlwa (Coconut) and Wale Okediran (Tenants of The House) shared the honours while Sifiso Mzobe won it in 2012 for Young Blood. Akin Bello would take the honours in 2014 for his play The Egbon of Lagos. This year the prize is being judged by a jury chaired by Margaret Busby supported by University of Texas’ Professor Toyin Falola, author of A Month Sweeter than Salt and Lagos-based international literary scholar, Olu Obafemi. This year’s edition of the prize is for poetry and there were 110 submissions from 11 countries on the continent, including Uganda, Kenya, South Africa, Nigeria and Rwanda. Earlier in the month the longlist with 9 of the finest poets plying their trade on the continent was announced. Servio Gbadamosi – A Tributary in Servitude. Tanure Ojaide – Songs of Myself. Harriet Anena- A Nation in Labour. The winner will be declared at a ceremony in Lagos, Nigeria on December 9, 2018. Previous Previous post: Dro, Tubosun, Masinyana, Ndlovu are Morland Writing Scholars 2018. Next Next post: Leila Aboulela for International African Women Writers’ Symposium 2018.